A fifteen dollar car figures into several of my Dad’s stories from his days out west. 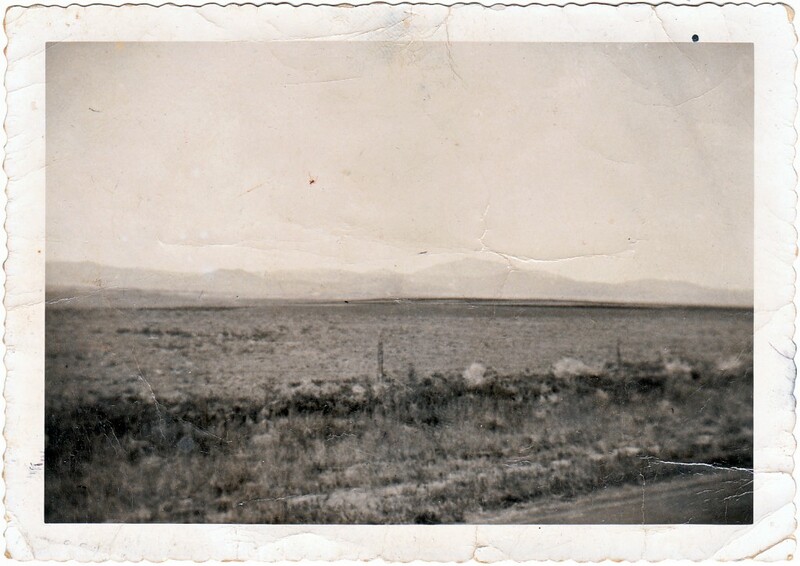 In spite of the price it was reliable enough to get him across some impossibly empty expanses, like the one pictured above. On the back of this photo my Dad wrote a brief note, “Looking west from Isolation Junction.” I don’t know where this is, but it has to be one of the most appropriately named places in the world. In 1952, when he was 17 or so, he hitchhiked from his home in Canal Winchester, Ohio and spent the next several years wandering the wide open spaces and working at a variety of ranches. One of the ranch names I recall him mentioning was Ben Roberts Bug Ranch – think it’s in Wyoming. Somewhere along the line he bought this car for $15. Times were hard, and there were plenty of days when lunch or dinner might be a single can of beans, purchased at a service station or a little general store in the middle of nowhere. He was not about to eat cool beans, but how to warm them up? There were no microwaves in those days. Houses were few and far between, and how many of their residents would cotton to strangers coming in and cooking beans on their stove? Building a fire was a possibility – and with it came the even greater possibility of a prairie fire. And doing any of these things would prevent him from doing what he really wanted to do, which was getting on down the road. Clever as he was, my Dad found a solution that let him have hot beans and make good time toward his next destination. He would open the hood of his $15 car, nestle the unopened can of beans in the top of the car engine, close the hood again, get in the car and drive. After a few miles he’d get out, retrieve the can from the engine, and open it with his jack knife. Hot beans. There was something elegant about using the heat from a car engine to cook beans, while making good time on the road. That’s because ingenuity goes into overdrive when you get specific about what you are absolutely unwilling to accept. My Dad didn’t like cold food, and he didn’t like stopping for long when he was on a road trip. Even when I was a kid, I remember him telling us, “Let’s get back in the car kids, every minute’s a mile!” Had he been willing to settle for cold food, or wasted time, he would never have found this solution. But at least one time, Dad said that things didn’t work out so well. Maybe it was the hot weather or the high altitude, or maybe he just drove too far. Whatever reason, when he pulled over to the side of the road to check his beans, he found the can had exploded. Beans everywhere. So I guess the moral of the story here is, if you’ve figured out a way to be clever, that’s a good thing. Just don’t go too far with it, or you might make a mess.